Last week both Maria and I gave presentations at Rebel Jam 2015, the global on-line event bringing together change agents worldwide. All of the talks are now on-line, and the links below will take you to our talks where you will also see the slides as well. I was one of the first people to talk, and just minutes before I was due to begin, I was told that the speaker after me unfortunately had to cancel. So I was asked to continue presenting, which is why my presentation is around 50 minutes. This of course gave me a chance to explore the dynamic concept of wholeness which we write about in Holonomics in depth, and I look at how this compares with other conceptions of wholeness such as holism, holons, holistic and Holacracy. 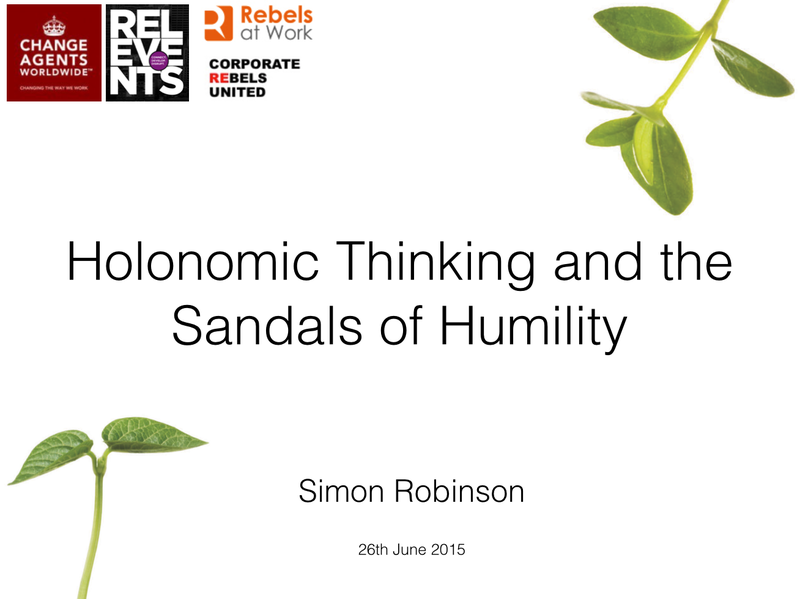 As for the title, well if you want to discover just how powerful The Sandals of Humility is as a concept, you will need to listen in to understand it in the context of how Holonomics and holonomic thinking was introduced into an entire organisation. When you click on the links for our talks, you will have a chance to watch the talks on-line (Playback) or download to watch later. You do not need to register, but you will need to provide your name and email to access the talks. Maria spoke later in the day on her work which is focused on the introduction of human values into major organisations. While we describe Holonomics as a transformation in consciousness, the actual implementation of holonomic thinking has as its foundation human values, and so I can really recommend that you listen to all Maria has to say about this, as many organisations here in Brazil are now starting to pay close attention to this aspect of Holonomics, as a way to truly enable profound organisational change in their businesses. Rebel Jam is a co-production from Corporate Rebels United, Rebels at Work, and Change Agents Worldwide, and was made possible with many supporters, facilitators and moderators, as well as sponsorship from Relevents who are committed to helping people transform through re-imagining the concept of conferences in the 21st century. 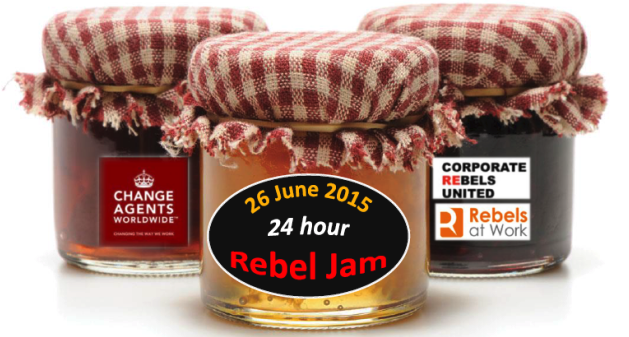 Maria and I are extremely grateful to all who made Rebel Jam possible, and we also encourage you to take a look at the many other amazing examples of courageous and rebellious change happening in organisations world wide.